The ultimate accessory pack to mount your phone, GoPro, tablet and a tripod mount creating endless possibilities to put your tunes where you want them. GoPro Compatible Mount: Film your party/pool party. Can be attached to any of the attachment ports on the AJX-3 and AJM-3. Dual Position Phone Mount: Compatible with most major smart phone brands up to 5.5”: including iPhone 6, 7, 8, X, HTC and Samsung. Dual Position Tablet Mount: Compatible with most major tablet brands up to 10” including iPad, iPad mini. 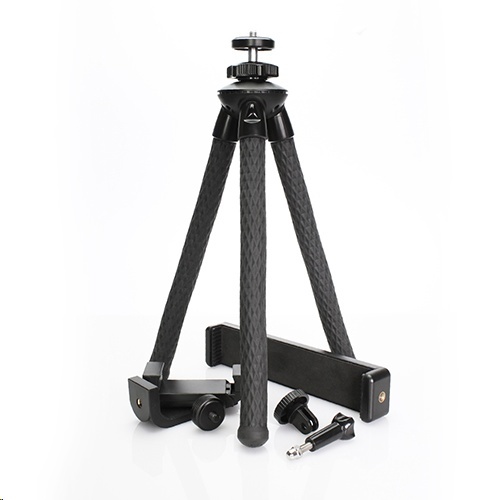 Flexi Grip Tripod: Super versatile tripod with high grip flexible legs allows you to grip onto any surface and hook/wrap around beams, poles, trees and more. Will support AJX-3 and AJM-3. Double Ended Bolt: Attach with your AJ phone and tablet mounts or use to attach a standard (for camera and tripod) ¼” screw mount.